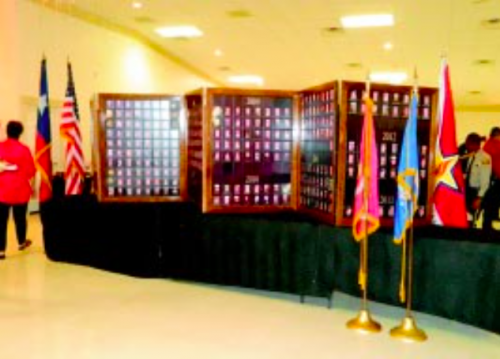 THE VETERANS EXPO included this Texas Wall of Honor, depicting all those servicemen who have lost their lives in various wars over the years. The display was prepared and shown by Carson George, who lost a son in the Gulf War. This is his tribute to all veterans. 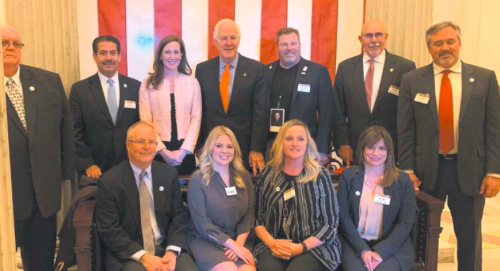 NORTH CHANNEL – Hundreds of veterans, family and friends were present last Thursday, as the North Channel Chamber of Commerce held their Salute to the military Veterans of our community on the week before Veterans Day, Nov. 11th. The EXPO event was held at Armenta’s Banquet Hall on Sheldon Road in Channelview. It included a lunch, speeches by service groups, and short club meetings by North shore Rotary, GP/JC Rotary, and the Pilot Club. Participating in ceremonial flag presentations and music of the service groups were the C.E. King HS Junior ROTC. Introductions and Sponsor recognition were announced by Master of Ceremonies Greg Ollis, superintendent of Channelview ISD. Recognition of participating Law Enforcement agencies, Fire and EMT departments, was made by Bill Palko, a veteran and past president of North Shore Rotary. Hospital to visit with other veterans who could not otherwise attend. Community businesses were sponsors of the event, and had booths and displays.